Peterborough United pair Marcus Maddison and Jack Marriott could return to action in tomorrow’s friendly at St Neots Town (July 14, 3pm). 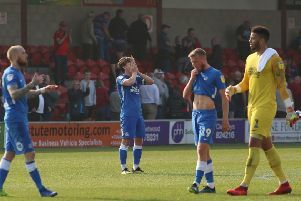 Posh are expected to sell both players before the start of the League One season on August 4, but with no bids for either accepted it’s a possibility both could be given some much-needed some match practice. It’s understood Marriott is more likely to be involved than Maddison. The latter’s departure from the ABAX Stadium is thought to be closer. Maddison’s release clause has been activated by two Championship clubs, but Posh want the fee in full up front rather than the payment programme offered by the bidders, Several clubs have bid for Marriott, but none have yet matched Posh’s valuation, believed to be around the £6 million mark. Posh have scored 18 goals in three friendlies without their star men. St Neots, who lost 5-1 at home to MK Dons earlier this week, are a slight step up in standard. Posh will agains be without injured pair Jermaine Anderson and Adam King, but goalkeeper Conor O’Malley could return after recovering from a calf injury. Trialist midfielder Anton Rodgers will again be involved. Admission tomorrow is dadults £8, concessions £5 and Under 16 free (must be accompanied by an adult).